‘They must have one,’ I said to my daughter, ‘all good hotels have one . . .’ and this was an lovely little hotel on the shores of Lake Garda. In the end I did discover it on a window sill along a little-used corridor: a small collection of books left behind by earlier visitors. It was something of a disappointment: the only thing in English that really fitted the bill was Michael Connolly’s latest – and I’d read it. I thought fondly of the collection in the hotel we stayed in last year: the excellent Hotel du Lac in Bellagio on Lake Como. It’s a long-established hotel and they had clearly reached the admirable decision that they wouldn’t throw out anything. There were hundreds of books, forming a kind of snapshot of popular reading stretching right back to the 1960s: James Herbert’s The Rats, Arthur Hailey’s Airport, even The F-Plan Diet(remember that? ), to name only a few. 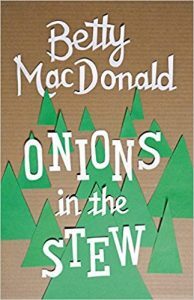 I picked out Betty MacDonald’s Onions in the Stew, a book I have never actually seen anywhere else and read it during my stay. And before I left, I made my own contribution, Jane Harper’s The Dry. There’s something very enjoyable about discovering a gem in a hotel library of generally rather dog-eared paperbacks. One of the most memorable for me was around twenty years ago in a hotel in Greece, picking up Michael Connolly’s The Concrete Blonde, and being so gripped that I read it all in one gulp. I’ve been reading Michael Connolly ever since. I would love to hear of other serendipitous discoveries . . . 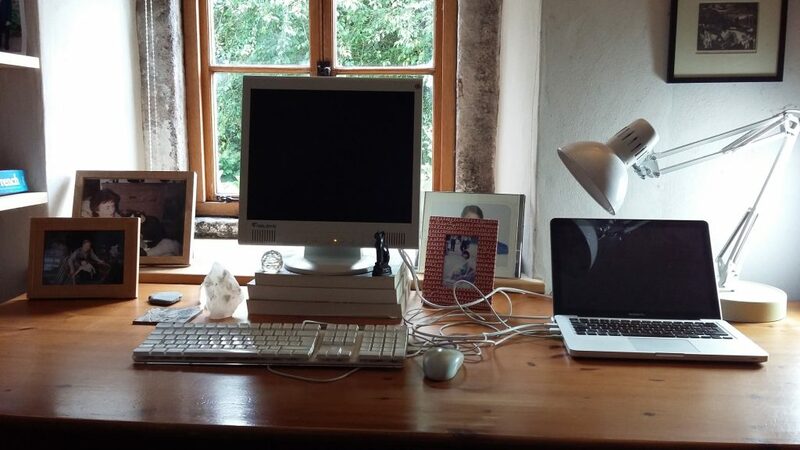 It is years, quite literally years, since my desk looked like this. In fact, has it ever looked like this? Today I at last got to work, vacummed cobwebs off the windowsill and washed the window. I took all the papers and miscellaneous stuff off my desk and sorted them and then I cleaned it. See how it gleams! Outside the window I can see my neighbour’s plum tree, laden with yellow plums. On the shelf to my left the cat is curled up between the Oxford Dictionary of Quotations and my intray. To the right is a wall of shelves two deep in crime novels. On the desk are my favourite photos of my husband, our younger daughter, and my mother. There is a paperweight given to me my dear friend, Jo, for my 21st birthday, a small sculpture by another friend, and a few other totemic objects. I am all ready to go. Tomorrow I am starting my new novel.